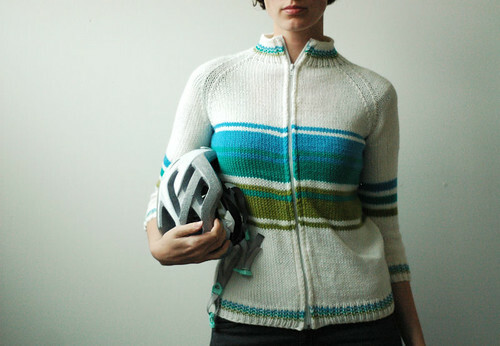 Back in November I wrote that I'd finished my Faire du Vélo bike sweater, which I started last June (I blogged about it here and here). I hadn't gotten any finished photos yet because it really won't be warm enough to wear it for a few more months, as I designed it with spring, summer, and autumn mornings and evenings in mind, but I thought it was about time I got some photos so that I could share it with you all. I think I really managed to execute my idea - a handknit zip-up sweater with the feel of an oldschool cycling jersey - and I'm quite pleased about that. 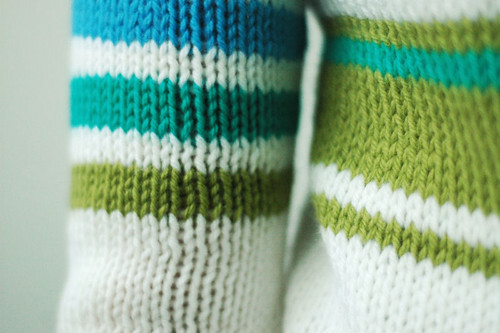 I really love the stripes, even if the blue and the turquoise are a bit close in color. It's knit in one piece from the bottom up, totally seamless, with the zipper sewn in afterwards. I typically do a cable cast on to start a project because I find it a comfortable and easy cast on to do, and it's versatile enough to work for the different sorts of things I knit, but I decided to try out a tubular bind off at the neck, and oh man, am I a convert. It's ingenius. I'll have to give the cast on a try as well. This was also my first time sewing a zipper into my knitting, and I didn't quite get the stripes to line up perfectly in front, but they're close enough to not bother me too badly, and now I know for next time that I should definitely baste the two sides together before I pin in the zipper. I'm not certain if I'm going to work up a pattern for this or not (it's not high on my to-do list, anyway) but I have a good handle on the changes I'd like to make if I do decide to do that. 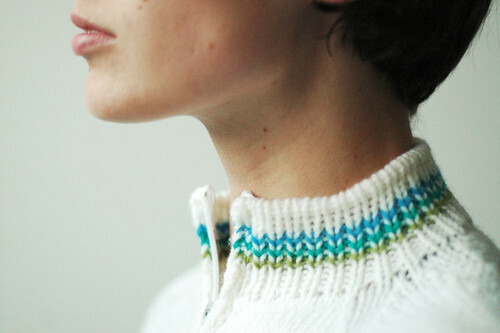 I'd work the edges with the tubular cast on and bind off, and I'd probably work in some short rows at the back before joining the sleeves for the yoke, so that the back of the neck would sit higher than the front. I'm quite pleased with the stripe sequences and the raglan shaping, though, and I'm looking forward to wearing this as we head into spring in a few months' time (and perhaps I can get some photos of it in action when I do). I don't typically knit anything this bold or sporty, so this was a fun change of pace.